Regular readers will know I have written a few times on the beginnings of bioinformatics (see links at the end of this brief article). Tonight I bring to you a video that is now several years old, but which I’ve only found for myself tonight. It’s one of a series, Profiles in Discovery, that can be found on YouTube. In it bioinformatics pioneer Russell Doolittle presents some threads of the phylogenetics tree of bioinformatics, the developing lines of research that gave rise to what we’d today call bioinformatics. His research work is, of course, very well-known those who have been in the field for more than a few years. I know of his work starting from teaching myself bioinformatics in evenings whilst working as a computer programmer as his name would pop up the papers frequently. I can remember reading his book Of URFs and ORFs* (1986) as a student. Interestingly, a few copies of it are still in stock at a number of on-line bookstores. A preview can be found at Google Books. Enough reminiscing. He speaks well, as you might expect. 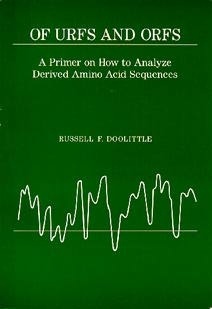 I’d encourage readers to listen and get a little bit of feel for the pre-1990 era of bioinformatics, whether their background is in bioinformatics or some area of biology. As you might expect, his talk covers more the work he personally has association with, but it still coveys the type of work done and the issues involved – the reason for my showing it here. New Zealanders will note that he mentions New Zealander Allan Wilson. I’m a little unsure how new to bioinformatics who have come from outside biology will take it, especially those who work keeps them only in one small area of bioinformatics as it possibly works better for those who are able to connect different areas of biology and bioinformatics. Nevertheless I believe people should have some appreciation of the history of ‘their thing’, so give it a solid try. Biology students will possibly appreciate it better. Personally I like the small things he mentions in passing that either connect with things bioinformatics still does, or reflect things that were done then and the odd bits of humour thrown in. * For the uninitiated, URF = unidentified reading frame; ORF = open reading frame. In a face-to-face interview at the very end, from about 53 minutes in onwards, Prof. Doolittle remarks that there is not a lot of “broad and capable” any more. That observation strikes a chord with me.